How many times have you heard your children whine that sentence on a hot summer afternoon? For the month of July, you have the perfect response: “You can’t be bored. It’s National Anti-Boredom Month!” That’s right. There is no boredom allowed for the month of July, so we’ve made a list of surefire lethargy-fighting activities. Kids tend to have a flair for the dramatic, so pull out all the stops and let them showcase their talents on stage. Write an original play or adapt a popular fairy tale or story into a simple script for your young actors. Jot down basic lines, but encourage the kids to adlib and have fun with their roles. Dig through the costume bin to create a Broadway-worthy wardrobe, and arrange a special performance for parents and friends in the neighborhood. It can be hard to convince your kids that cleaning out their closets is actually fun (same with doing the dishes, mowing the lawn and taking out the garbage), but hosting a family garage sale can be a great incentive. Get the whole family to pitch in and gather clothes, toys, sporting equipment and household goods you aren’t using anymore, and sell your wares at a weekend garage sale (here are some tips to get started). Decide together what you want to do with the money you raise—a day at the water park, a movie theater outing or a special dinner out… Enjoy a clean house and a fun reward for the family. Can you touch your tongue to your nose or wiggle your ears or do a perfect imitation of a chicken? What about juggling or doing cartwheels or singing like Hannah Montana? Start an impromptu silly tricks and talents contest, and get goofy right along with the kids. Cheer each other on for all of your incredible (and incredibly funny) talents. 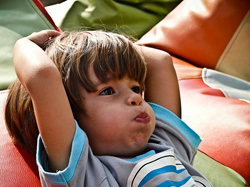 The heat can exacerbate boredom, so cool down to revive your energy. Change into swimsuits and run through the sprinklers, fill up the wading pool or have a water balloon and squirt gun battle. Everyone will feel the relief of escaping the heat, and it’s a fun way to keep active. If the idea of moving around too much, even in air conditioning, sounds exhausting, it may be time for a card game marathon. Grab a pack of playing cards and some cold lemonade and settle in for your favorite games. Crazy Eights, Speed, Old Maid, Go Fish, Rummy… the possibilities are endless!